the thrift store the other day, and even though we already had furniture in that room we couldn't resist. Our over-sized couch and chair were way too big for the space anyway, so we were happy to replace the big chair with this lovely one. Just look at all the space there is now! 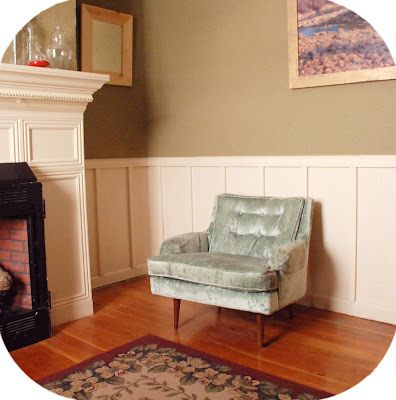 We could never see all the pretty wainscoting because the overstuffed chair covered it all up. We still have the large couch in there but it's gotta go. It's massiveness really dwarfs this chair; they don't look very good together. Eventually we will add other smaller stylish pieces to make the room have the right scale. We find ourselves in that room a lot more lately. Hot Cha! nice find! Jealous am i :). Awesome CHAIR!! lucky lucky you!